In the future, your room might be 3D printed by a robot that can spray layers of concrete to create customised walls and toilets. 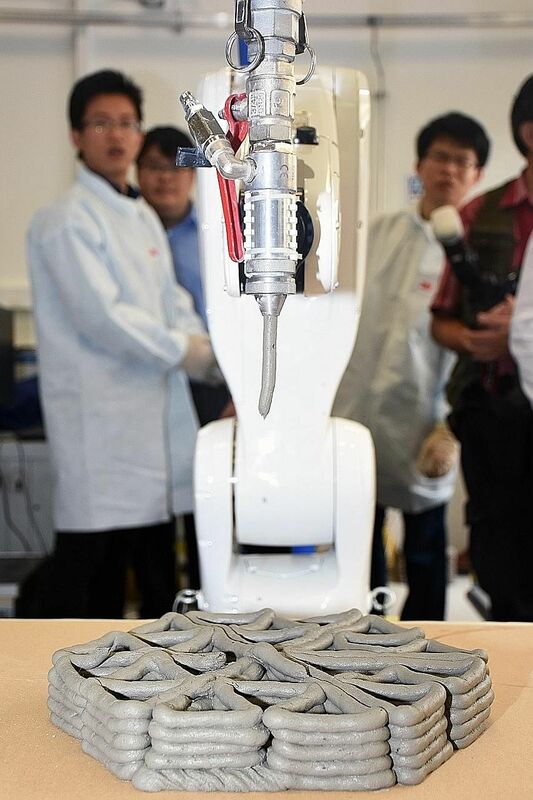 A newly launched $42 million 3D printing centre at the Nanyang Technological University (NTU) will look into developing such capabilities for the manufacturing and engineering sectors, among others. Funded by the National Research Foundation (NRF), the Singapore Centre for 3D Printing is one of the largest in the world. It was launched by Minister for Trade and Industry (Industry) S. Iswaran yesterday. 3D printing is a process in which three-dimensional parts are produced by adding materials layer by layer. These materials can be made of plastic, metal or even tissue from cells. NTU Professor Chua Chee Kai, executive director of the new centre - which will have more than 85 PhD students - said: "Not only can 3D printing do it (make things) faster, but it can also do things that previously could not be done." In his speech, Mr Iswaran said that the additive manufacturing industry is expected to grow from $3 billion in 2013 to $13 billion by 2018, and exceed $21 billion in worldwide revenue by 2020. Not only can 3D printing do it (make things) faster but it can also do things that previously could not be done. NTU PROFESSOR CHUA CHEE KAI, executive director of the new centre. The advantages of 3D printing would also make manufacturing much more adaptive as firms can adapt designs to suit the needs of their customers. The new research centre will partner leading firms in the manufacturing industry. Four research collaboration agreements were signed yesterday at the launch held at NTU. They were with ST Engineering, Keppel Offshore and Marine Technology Centre, Sembcorp Design and Construction and Emerson Process Management. Funding from NRF will be given out over 10 years; the centre has also attracted an extra $41 million from the industry and various government agencies. NTU scientists are working on several new developments in construction, including a new way to 3D print customised concrete structures for buildings such as beams and pillars. This process is expected to be more cost-effective than current casting methods. On the sidelines of the event, Mr Iswaran, who was appointed as the new co-chairman of the Committee on the Future Economy (CFE), said the committee has been making steady progress. The CFE, announced last October, is tasked with charting the course of Singapore's future economy. It will study key areas that are crucial to sustaining economic growth and equipping workers with skillsets needed for the future. "My objective and priority working with Mr Chan Chun Sing, who is now the deputy chairman, is really to continue that work in the spirit in which Mr Heng Swee Keat and I got started in this, to ensure that we complete that process in order to yield important ideas and recommendations for the Government to consider," said Mr Iswaran. "And, of course, we are all keeping Mr Heng Swee Keat and his family in our prayers and in our thoughts. We would like him to come back as soon as possible."